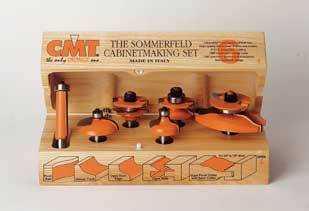 CMT�s popular Sommerfeld Cabinet Making Set is now available with the ogee raised panel profile. Make raised panels with a table mounted router that rival those made with expensive machinery. The new Sommerfeld Cabinetmaking Set features six router bits designed expressly for making arched raised panel doors and professional drawer fronts. The set includes the following: OGEE RAIL AND STILE MATCHED PAIR - Two separate cutters eliminate the frustration and time-consuming setup of reversible cutters. The stile cutter has a shear angle to produce superior cuts. RAISED PANEL BIT WITH BACK-CUTTER - The 3-1/2� diameter bit has a back-cutter which allows milling of both the front and back of the panel in the same cut. An additional 1-1/4� diameter bearing promotes safety by allowing you to take two shallow passes. SUPER-DUTY FLUSH TRIM BIT - The 3/4� cutting diameter gives a superior cut with minimal chipping, even on end grain. OGEE DOOR EDGE BIT - A subtle cove followed by a small roundover adds an elegant touch to the door edge. DRAWER FRONT BIT - This unique bit makes a mini-raised panel cut on the outside edges of the drawer fronts. A companion video demonstrating each bit and the use of templates is included at no extra charge.